It’s tough to stay balanced during the buzz of the holiday season. There never seems to be enough time to fit everything in, including yoga. When you feel strapped for time, use these three practices to refocus your awareness. Take five slow breaths in and five slow breaths out. It sounds easy, but when you’re overwhelmed or stressed the breath tends to be shallow. Reset with five mindful breaths and if you feel you need more, take ten. Rebalance your intentions with tree pose. When we feel unbalanced emotionally, it’s often apparent in our practice. Tree pose will help you find stability and strength to endure the holiday season. From a standing position, take your hands to heart center. Shift your weight into the right leg. Bend the left knee and bring the sole of the foot to the inner thigh of the right leg (other options: bring left foot to the calf, tent left foot with toes on the floor and heel against the right ankle). On the standing leg, focus on rooting down through the sole of your foot, as though you could spread roots into the floor.Press the sole of the left foot into the right leg. Picture them merging together to form a strong base, like the trunk of a tree. Notice the stability you’ve created with this strong base. Notice the freedom it gives to the upper body, a feeling of lightness. Feel free to take your hands overhead like branches of a tree. Take 10-15 breaths in the pose and repeat on the other side. No mat? No space? No problem! 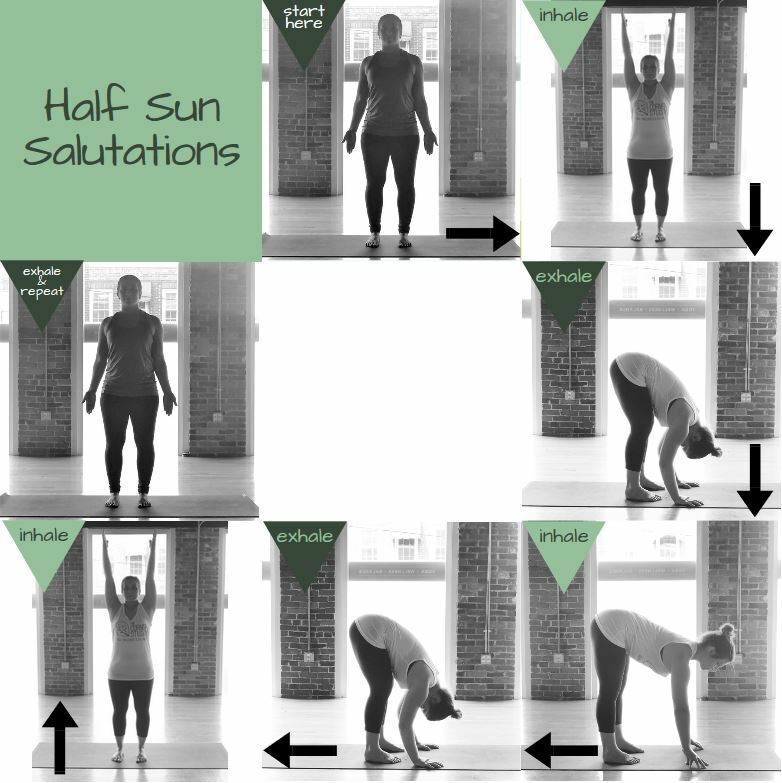 You can do half sun salutations anywhere. Start your day or refresh your afternoon with 3-4 rounds.